What Can I Use To Clean My Sneakers? Have you ever been to a festival at Piedmont Park in Atlanta, Georgia? Want to wear your last summer or winter sneakers? That festival has left its mark and dirt on your sneakers, what now? Don’t worry; cleaning sneakers are easier than you think! The sneaker cleaning step-by-step plan in this article applies to most of the sneakers sold out there. First of all, let’s get into all the tools that you are going to need. Keep in mind that you may not use all of these tools. It just depends on what exactly you’re cleaning on your sneaker, but I’ll be sure to mention what tool is specifically needed for certain sections on your shoe. First, you are going to need a bowl of water. It doesn’t matter what the temperature is, so warm water is also OK. If your midsole has any texture to it, you may need a toothbrush to get in there and lift off that dirt. Then, you also need a standard synthetic shoe brush (William Coit is recommended). This is going to clean the upper of your sneaker, but if you are working with premium leathers or woven materials, you should go with a boar bristle brush, which will be a lot softer. For the cleaning solution, you can go with an eco-friendly all natural dish soap. Put a little bit in some warm water. Make sure that it should say on the bottle that it is fragrance-free, dye free, and non-toxic. This is going to ensure that it doesn’t cause any yellowing on your shoes. If you have William Coit’s cleaning solution, I recommend you use it since I found it to be more effective than the dish shop. Finally, it would help if you had a microfiber towel. This is to wipe down your shoe at the very end. So now, let’s get into how exactly you should clean your sneakers. So first, if it’s just the midsoles of your sneakers that need to be cleaned, then all you need is just a magic eraser. Dip the sponge in a bowl of water. Squeeze to remove any excess water. Then, you’re going to rub the sponge on the midsole to remove all of that dirt. To really lift the dirt out, you need to use a toothbrush and take William Coit’s cleaning solution, put it on the toothbrush, shake it out, and then start scrubbing with that to get that dirt out of there. It’s going to lather up, very nicely, which you want, and you just kind of vigorously scrub. Once you cleaned it thoroughly all around, you are going to take the microfiber towel and wipe the midsole part. The fact is, it can really lift the dirt off. If your sneaker needs a deeper clean, then you should go a little bit further than that, so let’s get into how to clean the entire sneaker thoroughly. First off, what you want to do is take your microfiber towel and wipe the surface of your sneaker. This is going to remove any loose dirt that is sitting on the top of the fabric. Then, clean up the shoelaces, if they seem really dirty and your shoe tongue is so dirty, you want to unlace your shoe and throw the laces into the washer with a load of whites on the hot cycle. You want hot water to wash your shoelaces, and that is going to get them nice and clean. So, let’s get started by getting your brush ready. Dip it in some water. Shake off the excess. Then, you’re going to take your William Coit’s solution and pretty much douse the brush. Be generous with the amount of liquid you put on, and then dip the brush back in and shake off the excess and now we’re ready to scrub the shoe thoroughly. I always like to put my hand inside the shoe to be able to hold it, and then, you are just going to scrub the shoe. So, as you are brushing the upper, you also wash the midsole at the same time. That way, you completely clean the entire area of the sneaker. Sometimes you have hard-to-reach areas, so you will use a toothbrush to really get in there. Then, take your microfiber towel and wipe away all of that foam to see if any areas still need to be brushed. When they’re dry, you should lace them back up with my clean laces. So, these are fresh out of the washer. Typically, your sneaker will look so much cleaner than the dirty ones that you started with. Moreover, it takes only 5-10 minutes to do it. They will look pretty much brand new, fresh, and excellent. By doing this monthly, depending on how dirty your sneakers get, that will ensure your sneakers are looking brand new. If you don’t want to spend the time cleaning your sneakers, just call William Coit at 404-500-6527. 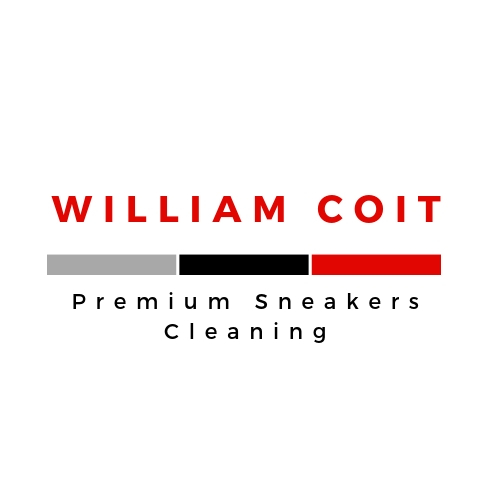 William Coit Premium Sneakers Cleaning will pick-up and drop off your sneakers in the Atlanta, Georgia metro and bring them back to as close as possible to the original condition. Visit our website at http://williamcoit for pricing, then call us for a quote. We LOVE cleaning sneakers and making our customers happy.